bengkooi: @Leslie, do you prefer to read in English or Chinese? Choongs: Tashilhunpo Monastery (Tibetan: བཀྲ་ཤིས་ལྷུན་པོ་), founded in 1447 by Gendun Drup, the First Dalai Lama, is a historic and culturally important monastery next to Shigatse, the second-largest city in Tibet. The monastery is the traditional seat of successive Panchen Lamas, the second highest ranking tulku lineage in the Gelukpa tradition. The “Tashi” or Panchen Lama had temporal power over three small districts, though not over the town of Shigatse itself, which was administered by a dzongpön (prefect) appointed from Lhasa. Located on a hill in the center of the city, the full name in Tibetan of the monastery means: “all fortune and happiness gathered here” or “heap of glory”. Cliff: Next question: Why should someone keep Tsongkapa as their yidam above other yidams in this time and age? In today’s day and modern time, with technology, many types of entertainment and places to go, easy travel, communication, Internet, conveniences, we find very little time for actual hard-core, sit-down-study-meditation spirituality. Sorry to say this generation there are less people becoming monks or nuns. A lot of the things that monks/nuns do every single day would not suit many people of this generation and the upcoming generation. Other yidams may require vows/commitments to take that can be difficult to uphold by a lay person who needs to support his/her family and themselves whilst pursuing spirituality. Lama Tsongkghapa is a practice, a meditation that is simple, that is short, yet extremely effective. Tsem Rinpoche: Dear Rena, copy all that we wrote on blog chat for the last one hour and copy and paste and please do read up so you can learn more. I am happy you are in Kechara also. Pastor Jean Ai: (9) for worker and administrative monks, compassion to serve the sangha so that the scholar monks and lamas can be relieved of secular work to only study and teach (10) guru devotion. To hold one’s lama with the highest respect because without our gurus, we would not have access to the Dharma and gain any kind of realisations and insight into the higher teachings. We can study from books but that is not the same as a teacher who elucidates the Dharma clearly and skilfully, and creates the conditions for us to practice. Since we did not have the merits to learn from Shakyamuni, our teachers keep their commitments so that we might be able to connect with the Dharma. Tsem Rinpoche: Very good Pastor Jean Ai, powerful information. Eeerm, Pastor David, yooohoooooo, where are you hiding? gopinath: dearest rinpoche thank you again Guru Dev and I will be prepared in a months time . Su Ming: Dear Rinpoche, I am going off now to meet a few people b4 the Raya breaks starts tomorrow. William Chua will be on the blog chat if Rinpoche would like anything to be done by the gift team or myself. Kevin Lam: This is the first time I’m joining the chat. Dear Rinpoche, so many things I can learn here. Thank you for the teachings and sharing. Leslie Leong: Thank you Pastor. I know there is this section and I am reading it slowly. Our lineage is rich with history, to fully understand it takes time:-) but I love it! In case I have many questions can I just direct it to any pastors? graceleong: Sorry trying to answer the question. Tsongkapa practice helps us to leave the body at death; when we do dissolution of the Tsongkapa practice ; we visualise the light in the 8 petal lotus in our heart; petal closed but connected by curd like string to Maitreya for an opportunity to be reborn in the pure land. sarahyap: When we invite home a Lama Tsongkhapa statue, we should light incense and also bring flowers in as we enter our home, we should also have a special table/altar that is higher than the level of our waist. We can place it anywhere in the house as long as it is in a respectful place. So we should avoid placing the altar near the toilet, or if we place it in our bedroom, our feet should not face the altar when we lay down. The size of our statue, it can be any size, 8″ or 3 feet, depending on our budget. But of course having a large Lama Tsongkhapa statue is the best! Tsem Rinpoche: Grace Leong and Kevin, nice to see you here. Save all that we have chatted here and must read through so the knowledge does not disappear..
GimLee@KFR: Does Tsongkapa’s practice help us leave our bodies at the time of death and take a ‘safer’ rebirth? Where and how is that done please? Yes Lama Tshongkhapa practice will help us during the time death to take good & safer rebirth when we practice the visualisation part of Gaden Lhagyama (Guru Yoga) during “Invocation” and “Dissolution”. Wei Theng1: On the road to KFR with Lew. Super jam. Think lots of people going back hometown for Raya festival. William: hello Rinpoche and everyone. Choongs: The successive Panchen Lamas form a tulku reincarnation lineage which are said to be the incarnations of Amitabha Buddha. The title, meaning “Great Scholar”, is a Tibetan contraction of the Sanskrit paṇḍita (scholar) and the Tibetan chenpo (great). The Panchen Lama traditionally lived in Tashilhunpo Monastery (Teshu-lumbo) in Shigatse. From the name of this monastery, the Europeans referred to the Panchen Lama as the Tashi-Lama (or spelled Tesho-Lama or Teshu-Lama). Kevin Lam: Noted Rinpoche. Will save all the chats. This is priceless knowledge. Choongs: The Panchen Lama bears part of the responsibility or the monk-regent for finding the incarnation of the Dalai Lama and vice versa. Choongs: In the lineage of the Tibetan Panchen Lamas there were considered to be four Indian and three Tibetan incarnations of Amitabha Buddha before Khedrup Gelek Pelzang, who is recognised as the 1st Panchen Lama. The lineage starts with Subhuti, one of the original disciples of Gautama Buddha. Gö Lotsawa is considered to be the first Tibetan incarnation of Amitabha Buddha in this line. Cliff: These are the many types of benefits that arise from Lama Tsongkhapa’s practice. Kevin Lam: May I know which mantra shall I chant when I see homeless, old folks, orphanage and patient in hospital? Thank you. sweekeong: Sorry, just to clarify. Benefit of Lama Tsongkhapa’s ‘teachings’ and ‘practices’ are the same? Kevin Lam: Thank you for sharing Gopinath. Tsem Rinpoche: Dear everyone, the most best and superior mantra to chant for yourself, the deceased, the animals, friends, spirits, the environment is Tsongkapa’s migtseyma mantra. Easy, complete and not commitments required. It is the essence of all the Buddha’s mantra of the ten directions. Choongs: The fourth Panchen Lama Lobsang Chökyi Gyalsten composed the Lama Chopa (Guru Puja). Eric KP: Does Tsongkapa’s practice help us leave our bodies at the time of death and take a ‘safer’ rebirth? Where and how is that done please? Answer : Yes, By Lama Tsongkhapa practice, we gain this ability to engage in Powa practice, which will allow us to choose where we go and / or how we can come back to continue our spiritual practice to benefit others. This practice gives us a very strong connection to Maitreya Buddha. Kevin Lam: Thank you Rinpoche for your teachings. Pastor David Lai: @Leslie & Kevin Lam – Rinpoche advocates Migtsema for the homeless, old folks orphanage etc. graceleong: During the resolution stage of the Tsongkapa practice, we are in meditation, our body filled with Manjushris, Om Ah Ra Ba Za Na Dhis, Dhi images, implements of sword and Dharma texts. Our body is cleansed. Yama has taken on all our negativity. We are in bliss when Lama Tsongkapa ascends our heads on the lotus . Then we request for Tsongkapa to ascend via a channel of red inside and blue outside, to the luminous 8 petal lotus in our heart. The light, bean like ,sits in our heart and the lotus closes. The lotus is surrounded by a red and white mala. In between there are 3 rounds of Om Ah Ra Ba Za Na Dhi rings turning clockwise too. This luminous lotus is connected to Tushita heaven of Maitreya via a curd like string. We ascend to this pure heaven when we take a good rebirth in our next life ! Kevin Lam: Thank you Pastor David. graceleong: Thank you dear Rinpoche for your kind encouragement ! Sorry hate to but need to leave this chat for a little while . Will be back !! sarahyap: What is the difference between having a poster, painting of Tsongkapa or statue? All images of Buddhas are good, but the difference that come from the type of item plays a role. While a poster is good, and also can be blessed by great Lamas, when we use the poster on our altar, it can serve only as a meditational tool for us when we do our sadhana. A painting is much better than a mass produced poster, because more effort it put into getting or commissioning for a painting. We can also offer gold on our painting which is a wonderful offering to our Lama Tsongkhapa image. Also, if we have a good artist that is Buddhist, with great meditation and sincerity, he/she can paint a Lama Tsongkhapa image that has a lot of blessings in it. A statue is one of the best options we can get. We can fill it with mantras, holy items from the monasteries and from our guru. We also have many chances to offer nice offering on Lama Tsongkhapa. Choongs: Choekyi Gyaltsen, the 10th Panchen Lama, became the most important political and religious figure in Tibet following the 14th Dalai Lama’s escape to India in 1959. Tsem Rinpoche: Joy, when you make others and your teacher wait, it is very undharmic. 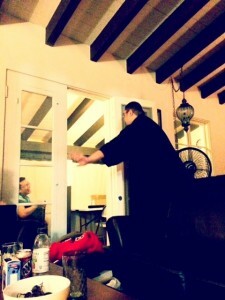 Tsem Rinpoche: Gim Lee, very good. Dear Gim Lee, what are the benefits of becoming a nun for this life and future lives? Tsem Rinpoche: Dear Everyone, I rarely go on chat, and when I do my aim is to teach. Those of you who are here have affinity to learn because you make the effort. sweekeong: Pastor David: The site shows the lineage between Sakya and Gelug. Maybe can find some lead of who gave Vajrayogini to Lama Tsongkhapa? gopinath: for meditation focus is importaint these substances makes the mind unfocused. Tsem Rinpoche: I will finish very soon and it is very good you remain till I finish. The teacher will leave and then the students leave..eheheh.. Just like in the monastery. Sharon Ong: Thank you with folded hands for this precious opportunity, Rinpoche. nicholas: Why and how does a high level Rinpoche, incarnate and take rebirth and why? A high level Rinpoche incarnate due to their compassion mind wanting to continue benefit sentient being in and chosen to take rebirth again in their next life to this samsara world. Due to their good Samaya with their Guru, commitment, integrity and discipline in the practices, they achieved the attainment to control their rebirth and able to choose where the want to come back. For a high level Rinpoche they will enter Tuktam (death meditation) to prepare themselves for rebirth. Once the consciousness left the body we will see a drop of blood from the nose with the head slightly tilt. Choongs: Dear all, and please don’t do any prostrations when Rinpoche leaves the room. Thank you. Tsem Rinpoche: Dear Sharon, you are very very welcome. I enjoy teaching you dharma as you are very intelligent and receptive always. 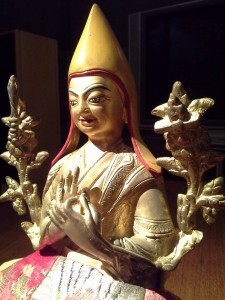 Antoinette@KFR: Dear Rinpoche, has Pastor Chia received the first Tsongkhapa statue? Pastor David Lai: @Swee Keong – The Vajrayogini lineage holder that is contemporary with Je Tsongkhapa is Jamyang Namkha Gyaltsen (Sakya Dagchen) 1398 – 1472. I think Je Tsongkhapa must have received Vajrayogini from him. Tsem Rinpoche: If we do the mantra of Tsongkapa daily then we smoke, then we chant mantra, then smoke, we are using our mouth for both. Will one override the other’s benefit or dis-benefits? Leslie Leong: Thank you Pastor. Will do as advised. JP: I think Irene was the first to invite a Lama Tsongkhapa statue. Who has the ‘oldest’ statue of Tsongkapa in Kechara? Meaning which student obtained their Tsongkapa statue first and years ago? Wan Wai Meng: Dear Rinpoche, Mama How received the first Je Tsongkhapa. Tsem Rinpoche: What is the single most powerful back up we can do to make sure our Tsongkapa practice stays firm and consistent? Tsem Rinpoche: Wai Meng, I mentioned those who are in Kechara. Tsem Rinpoche: Joy, why so long to type out your answer? When you whatsapp your retorts and replies and answers to ppl on whatsapp you are VERY VERY VERY FAST. Pastor Shin: Thank you JP ! – re First person who invited Tsongkhapa. Called Irene earlier but couldn’t get through. sarahyap: If we take drinks, smoke, drugs, damaging foods will it affect our meditations? If so how? Yes taking these intoxicants will affect our meditation practice. All these intoxicants will block, pollute and affect our inner channels which will cause our meditation practice to be ineffective. JP: Guru devotion is a very good back up. What is the single most powerful back up we can do to make sure our Tsongkapa practice stays firm and consistent? Pastor David Lai: What is the single most powerful back up we can do to make sure our Tsongkapa practice stays firm and consistent? – Maintaining our samaya with our spiritual guide along with keeping our vows and commitments. Kevin Lam: Thanks Pastor Jean Ai for your sharing. Wei Theng1: Chant mantra & smoking using the same mouth is conflicting as one is holy actions while the other is not. But it’s using the same mouth. Just like chanting mantra and eating meat using the same mouth is conflicting. sweekeong: What is the single most powerful back up we can do to make sure our Tsongkapa practice stays firm and consistent? Remembering our guru kindness, gratitude, and paying back his kindness by doing our commitments, and repairing our broken commitments, practicing with the view for benefiting all sentient beings, and with the goal of achieving enlightenment. gopinath: @pastor please correct me if i am wrong . doesnt migstema aids in the mind transformation and when mind transformation occurs these impure deeds will stop and the impulses will stop ? Sharon Ong: Pastor Seng Piow, I am not a smoker and as such, I can only guess what a smoker goes through. The habit forming part of smoking may distract one from their practice as the urge to smoke can override any other activities, even Dharma ones. Pastor JayJae庆《7月15日佛欢喜日》: Je Tsongkhapa said in Yonten Shigyurma, the Foundation of Good Qualities, all attainments comes from the Guru. From the Guru, attainments comes, from the Guru, u have the opportunity to hear the Dharma and likewise, from the practice of Guru Devotion, u safeguard your practice of Lama Tsongkhapa’s Guru Yoga. Pastor Shin: @gopinath – Why wait till mind transformation occurs to stop these impure deeds when we can stop it earlier? Tsem Rinpoche: Smoking and drinking is connected to increase of negative emotions. Also it is related to discipline. If we cannot discipline ourselves to stop poisoning our bodies with smoke and drink, how do we expect ourselves to control our speech, anger, hatred, etc etc….think…we have one human precious body and we should not waste it on pleasureless pleasures. gopinath: dear pastor since we are in samsara and at times it can be diffcult as the mind is attached to these things till we make the push to change.